The Hyster® Rhine Tour, supported by Pyroban, has concluded following four events in four countries in June and July 2018. The Rhine Tour started during TOC Europe from 12-14 June in Rotterdam, the Netherlands. A barge transporting Hyster equipment and solutions from suppliers like Pyroban then travelled on to Lauterbourg (Strasbourg), France on 21st June, Birsfelden (Basel), Switzerland on 26th June and Wesel, Germany on 9th July. At the event, solutions for a number of different container and materials handling operations were demonstrated. One demonstration saw a Hyster® H3.0FT lift truck fitted with the Pyroban Gascheka duo system operating in a port environment typical of an Added Safety area. The Gascheka duo added safety system provides gas detection around lift trucks, and other materials handling equipment, and shuts the equipment down upon detection of any gases present.. This system is often used for forklifts, pallet stackers, cranes and access platforms that are classed as ‘safe’ but are operating near to ATEX Zone 2 or Zone 1 hazardous areas. Pyroban was also featured in the Supplier Area at the event, where explosion protection experts were available to discuss the range of solutions for Zone 1, Zone 2, Zone 21 and Zone 22 ATEX equipment conversions available to customers throughout Europe and beyond. 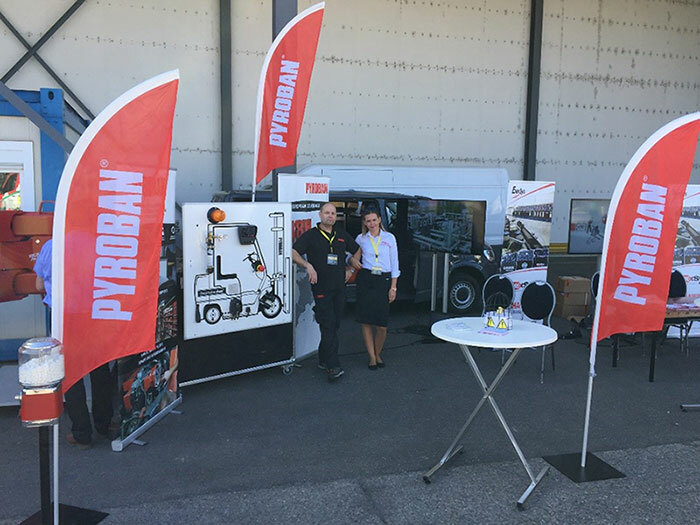 Pyroban supports equipment throughout the world and was pleased to see customers in France, the Netherlands, Germany and Switzerland during the event. For more about our solutions and services in your country, contact us.